Tire Shine gives your tires a high-gloss, long-lasting shine that keeps them looking like new longer. 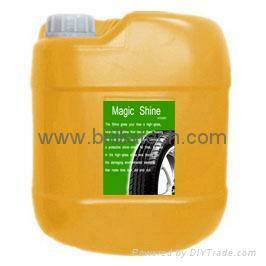 The innovative formula is a protective shine-shield for tires. It locks in the high-gloss shine and blocks out the damaging environmental elements that make tires look old and dull. You will notice that TIRE SHINE does not sling off, turn the edges of the tire brown or wash off with the first rain storm. This unique formula can be used on all rubber, vinyl, plastic trim on all vehicles. 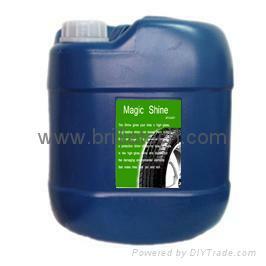 We have found that the best way to use TIRE SHINE tire treatment is to first clean the tire, as usual, and let it dry. Then soak the entire tire with TIRE SHINE, let it set for a few minutes, then buff to a shine. After a few spray and wipe applications you then can spray TIRE SHINE tire treatment on a cloth and rub it on the tire and buff to a shine.